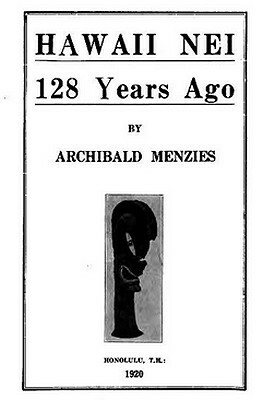 Archibal Menzies : Hawai'i , 1792-1794. [no publisher], Honolulu, T.H., 1920. A rare account from the visit to the Pacific of the H. M. S. Discovery under Captain George Vancouver, who had previously seved under Cook. Although there are several published accounts arising from the this voyage, only Menzies reports surfriding. In particular, he notes the use of surfboards for transport when off Waikiki (page 25) and women cliff jumping from 30 feet into the sea (page 180). His description, on page 82, of the harvesting of timber and canoe building are also of interest. ARCHIBALD MENZIES, whose account of his three visits to the Sandwich or Hawaiian Islands, when acting as surgeon and naturalist on board H. M. S. Discovery, Captain Geo. Vancouver, in the years 1792-94, is here presented to the reader, was born at Weem in the Highlands of Perthshire, Scotland, on 15th March, 1754. The morning of the 8th, our people were engaged in setting up the rigging fore and aft, and the caulkers began to caulk the quarter deck, the seams of which were so open as to admit the rain through them as it fell; nor were the natives less assiduous in supplying our wants. They began pretty early to bring off large calabashes of fresh water, some salt and refreshments, particularly vegetables in abundance. They also brought some pearls to dispose of, but they were for the most part small, badly shaped and ill colored, so consequently of little value; and whoever might be inclined to censure the conduct of the ladies for withholding their company from us on the preceding day, had now no reason to complain, for they came off in large groups, not only in the canoes, but on swimming boards with no other intention than of tendering their persons to anyone that would* choose to have them, and those who were unsuccessful in their aim went away chiding us for our want of gallantry. CAPTAIN VANCOUVER AND MIDSHIPMAN PIGOT NEARLY DROWNED. When we were afterwards going on board it was necessary to send in to the village for two of the affrighted natives to carry us in one of their canoes through the surf to the pinnace which lay off at a grappling, and by some accident or other this canoe upset in going with Captain Vancouver and two of the young gentlemen, who owed their safety in a great measure to the strength of the surf driving them back again upon the beach. Captain Vancouver would not trust himself again in the canoe, as he suspected the natives had upset it designedly. He therefore swam off to the boat attended by two of our own people who in going afterwards with one of the young gentlemen lost hold of him in a violent surf which broke over their heads, so that he was nearly drowned. On our hearing, however, a wild yell in the surf, for it was then dark, we suspected the danger, and rallied the chiefs to go and save Mr. Pigot, as he could not swim. To do justice to their feelings, they instantly threw off their garments, jumped into the surf, and soon after brought him on shore almost speechless. He was carried into a house where he was wrapped up in warm blankets, and, in a little time, happily recovered. These accidents induced those who were on shore to remain with the party. Captain Vancouver went on board wet and uncomfortable, and ordered two launches manned and armed, to come and lay off the beach all night, that in case of an attack from the natives the whole party might be able to retreat by embarking on board them. Everything, however, remained quiet. The chiefs continued with the party as usual, and to secure that confidence which they placed in us, I went into the village, where I was kindly treated and slept in Namakaeha's house all night. FELLING TREES FOR CANOES AND SNARING BIRDS FOR FEATHERS. The villages we passed in the woods I said were temporary, as the occupiers, consisting of a few families, had come up here only for a time to pursue various occupations. The men were differently engaged. who are distinct persons from those who thus form them in the "rough." A third set seemed to have no other occupation than that of catching small birds for the sake of their feathers, especially those of a red, yellow or black colour. These feathers are in great estimation. It is with them that a great portion of the rents are annually paid to the chiefs by the lower class of people, who thus employ themselves by catching the birds with bird-lime. About noon we came to a small village named Manuka where we found our chief Luhea's residence, and where we landed before his house at a small gap between rugged precipices against which the surges dashed and broke with such violence and agitation and with such horrific appearance, that even the idea of attempting chilled us with the utmost dread. ordinary dexterity with which they managed this landing. The other canoe was landed in the same manner, and as the chief had some arrangements to make, we were obliged in compliance with his request, to remain at this dreary-looking place all night. A situation more barren and rugged can scarcely be imagined. The kind civilities and good treatment received from the natives were, however, unremitting. Here, as if to make amends for the dreariness of the situation, they particularly exerted themselves by every means in their power to amuse and entertain us. The chief and his people were equally eager and attentive in doing little acts of kindness and thereby assiduously displaying their unbounded hospitality. Rev. W. Ellis, in his "Tour Through Hawaii," made twenty-nine years after Menzies' visit, describes this method of landing canoes on the rocky coast of Hawaii. See also illustrated article in Thrum's Annual for 1910, "Canoeing Off the Coast of Puna, Hawaii," where pictures are given of the method used by the Hawallans in lifting up and launching their canoes on the steep rocky coasts of Hawaii. In the afternoon our attention was at one time directed to a number of young women who stripped themselves quite naked upon the summit of a pending cliff, and taking a short run, vaulted one after another from the brink of it headlong into the sea regardless of the foamed and agitated appearance of that element, and as it were setting its wildest commotions at defiance. For at this time the surf ran very high, and dashed with furious force against the cliff, yet they dexterously disentangled themselves, and clambered up the rock again, repeated their leaps several times with seeming satisfaction, till they were quite fatigued. The cliff was at least thirty feet high, and so very rugged with peaked rocks, which were now and then deluged with a boisterous surf, that to look down the precipice was enough to intimidate anyone not accustomed to such extraordinary feats of activity. Geoff Cater (2013) : Archibald Menzies : Hawaii, 1792-1794.